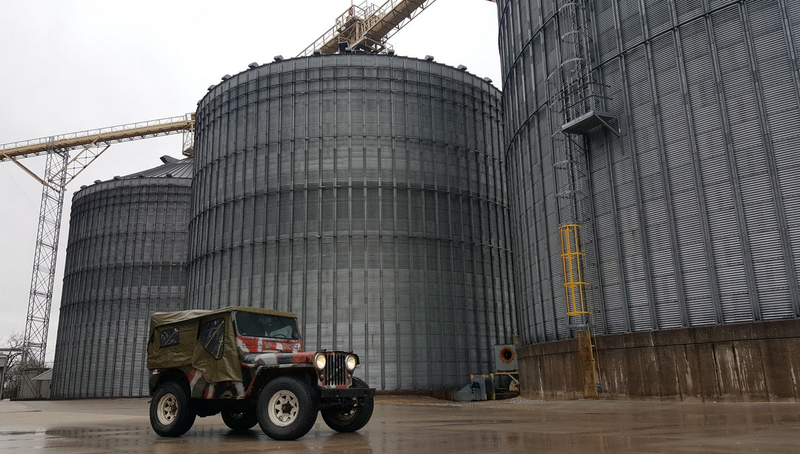 My Willys CJ-2A farm Jeep—a junker whose rust brought me to the brink of insanity, and arguably beyond—continues to blow my mind. At 40 miles per hour, the 1,800 mile trot from Detroit to Moab, Utah is set to be a long one. The good thing is: I’m over halfway there. I’m having a hell of a time trying to focus enough to write this blog post. In the past two days, I’ve driven 28 hours in a Jeep with a ride so viscerally jarring, even after I step out of that rusty tub, I can’t seem to slow my brain down enough to form cohesive thoughts. The Jeep’s short wheelbase and new, stiff shocks make even the tiniest bumps pitch the car up and down like a relentless bucking bronco. The loose and rusted body parts make noises akin to what I’d imagine the Titanic sounded like as it split in half. Add to that the constant wind noise, deafening tractor-engine under hood, loud oversized tires, horrible homemade seat and leaky gas tank, and driving that Jeep all these miles has been downright punishing. All of my senses have been so thoroughly abused, I’m not sure any of them function anymore. Take this hotel room I’m sitting in right now, for example: to me, it sounds like there’s an F5 tornado hiding in the closet. It also smells like someone poured a jerrycan all over the carpet, and is it just me, or is the bed totally underdamped? It’s just me. In reality, the hotel room is probably quiet, the bed is probably not bouncing up and down, and the carpet is almost certainly not saturated with 87 octane. Either all of my senses are totally jacked up from the ride in that bouncy, smelly, loud Jeep, or this is the crappiest hotel room in history. Since the last update, the Willys and I have driven through Illinois, Missouri and part of Kansas at a snail’s pace down gorgeous country roads. The war-tested Go-Devil engine chugged along under the hood, with oil pressure remaining steady at 32 psi, and coolant temperature hanging out near 195 Fahrenheit as the speedometer occasionally crested 40 mph. Then that grey sky began dumping cold rain relentlessly for the next twelve hours. And sadly, the little Jeep isn’t very well sealed. But despite the rain, driving through Illinois was largely uneventful. The Jeep drove through small town after small town, with the CJ-2A putting along happily in what felt like its home turf. Beat up old Jeeps abounded, and a number of locals struck up conversations with me at gas stations, reminiscing upon their own CJs that they used as barnyard runabouts in their youth. Small town America loves old Jeeps, and based on the trip so far, my old Jeep loves small town America. After nearly 14 hours of driving in cold rain, we arrived at our hotel in Chillicothe and I basically died on the bed. The next morning, we stopped by the auto parts store to buy a few more fuel filters, and to check fluids. Somehow, all fluids were still full. This Willys leaks and burns less than any other vehicle I own! How this is possible is beyond me. The drive into Kansas was the most beautiful drive I’ve ever experienced. Though I’m biased from having grown up nearby, I consider Missouri and Kansas some of the most gorgeous parts of this country—the rolling hills, the cattle, the vast plains, the blue sky, the creeks and rivers: it’s magical, especially from behind the wheel of a doorless Jeep. We stopped in St. Joseph to have lunch, and that’s when the country became even prettier. The biggest issue I had was staying awake. Back in my former life at Fiat Chrysler, my coworkers always used to call me “Narcolepsy Dave,” a name I earned after falling asleep in a JK Wrangler traversing the hardest trail at Moab, Pritchett Canyon. It’s a fitting name, especially after I’ve eaten. Who knew that going 40 mph through the middle of nowhere after scarfing down an enormous hamburger would put me to sleep? Poor Freddy had to deal with me pulling over every few hours to catch a Z or two. How he didn’t fall asleep going 40 in a 450 horsepower Raptor is incredible to me. The only issue I had during the journey from Chillecothe to Beloit, Kansas, was a horrible case of death wobble. If you’re not familiar with death wobble, it’s an uncontrollable shake of the front axle, usually instigated by a bump in a turn, or by the brakes. In my case, I stabbed my brakes to pull off the road for a pee stop, at which point the Jeep’s front axle basically grew a mind of its own, shaking up and down, left and right; there was absolutely nothing I could do. Since I’ve owned quite a few crappy Jeeps in my time, I’ve experienced death wobble before (at higher speeds, too), so I knew that all I had to do was hold the steering wheel straight, and apply the brakes. Eventually, the horror would come to an end, and it did. Otherwise, the drive was wonderful. After five hours by myself, driving through a completely barren Kansas landscape, I finally made it to this hotel room. I’ve got 800 miles to go. Please Jeep, keep it up—you’ve got this. If you’d like to follow along with my progress, check out my Instagram and Twitter pages.